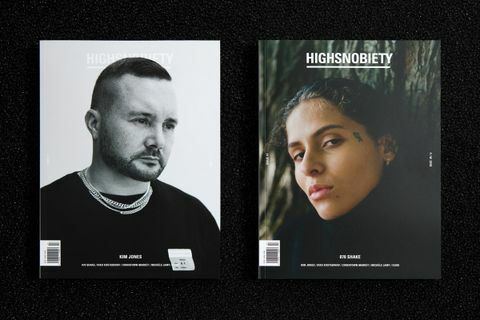 Kim Jones Thinks It's Time to Retire the Term "Streetwear"
Every great label lives in the shadow of its founder. At Dior’s most recent menswear show, presented in the barracks of Paris’ horseback cavalry, la Garde républicaine, that fact is writ large. 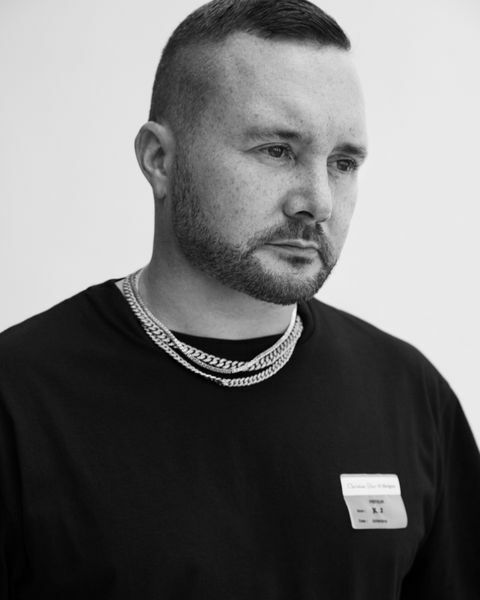 Kim Jones, the newly minted menswear artistic director of the fashion house, commissioned artist Brian Donnelly — better known as KAWS — to lend his street art stylings to Dior for the season. One of KAWS’ contributions is a 10-meter tall floral statue of the house’s founder, Christian Dior. Comprising 70,000 flowers in vibrant pink, crisp white, and stark black, it is the artist’s rendition of Mr. Dior as filtered through KAWS’ “BFF” character, a furry, four-fingered, Muppet-esque figure with a button nose and Xs for pupils. In his hand, he holds a white perfume bottle in the shape of Mr. Dior’s dog, Bobby — a reference to a limited-edition Miss Dior perfume bottle from 1952. 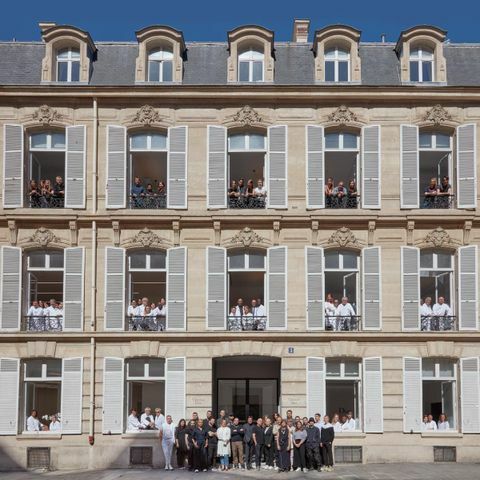 And here, in the shadow of Mr. Dior and his Bobby bottle, Jones is about to establish a new era at Dior Men’s. Born in London in 1979, Jones experienced a life of constant travel from an early age. His father was a hydrogeologist who brought the family along to far-flung locales such as Tanzania, Kenya, Ecuador, and the Amazon — with brief periods of respite in London in between. The designer still considers Africa his second home, and Jones recalls that it was in Botswana where he saw the first garment he ever loved: a T-shirt bearing the photo of a lion. At 14, he considered following in his father’s footsteps in zoology or conservation, but thanks to an adolescence spent obsessing over his sister’s treasure trove of fashion magazines, he switched toward something in the nebulous field where culture and creativity intersect. His collector’s instinct started to manifest back then, too, with the young Jones collecting vintage Levi’s pieces and getting exposed to London’s bustling subcultural scene, discovering designers such as Vivienne Westwood along the way. Today, Jones’ collection spans an impressive archive of ’80s London clubwear from designers and brands including Westwood, Rachel Auburn, Stephen Linard, and Modern Classics. In addition to pieces from Issey Miyake, Jean Paul Gaultier, and Christopher Nemeth, he once confessed in a 2016 interview with Designboom that he owns more than 500 sneakers, many of which are Nike models such as the Air Huarache and Air Jordans. Jones and his friends had trouble finding clothing they liked, so took a DIY approach in the vein of the punk movement spearheaded by Malcolm McLaren and Westwood. He took these designs to Louise Wilson, the late head of fashion at prestigious art school Central Saint Martins, who offered him a place in the program. 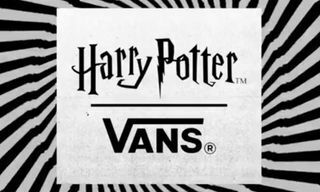 At the same time, Jones had been offered his first job in the industry by Michael Kopelman, an early member of the International Stüssy Tribe and founder of streetwear distributor Gimme Five. Jones’ earliest duties involved unpacking boxes of Supreme gear among others for distribution to some of London’s most prescient stores. 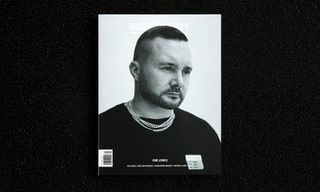 One such place was The Hideout, an ahead-of- its-time boutique run by Kopelman and Fraser Cooke, who currently oversees Nike’s buzziest collaborations and is responsible for bringing the likes of UNDERCOVER’s Jun Takahashi and Jones himself under the Swoosh’s fashion-forward umbrella. But before that, Jones was already generating buzz with his graduate collection in 2002. It caught the eye of designer John Galliano, who bought half of the collection. A year later, Jones made his debut at London Fashion Week, selling a prized Vivienne Westwood parachute shirt on eBay to fund the collection. Even then, Jones’ penchant for integrating sportswear and subculture into his clothes shone through, mining ’90s youth culture and rave festivals for inspiration. These influences were manifested in cropped Peruvian stripe bomber jackets, ombré-dyed denim, and collared bombers with a tribal print motif. 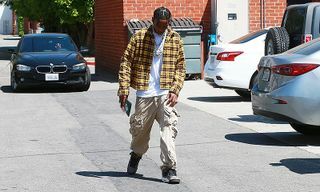 His penchant for rip-and-repair garments resulted in bicolor trousers in contrasting pink pastel tones and deep purple hues, patchwork pants, and material-blocked dropped-crotch nylon track pants styled with Nike Terminator high-tops. He established codes that mixed what was happening in streetwear with runway-worthy garments, catching the eye of Uniqlo, Hugo Boss, Topshop, and Umbro. With the latter he designed a capsule collection for several seasons until 2007 and worked on a 2005 football jersey collaboration with Supreme. In 2008, he was appointed creative director of storied British tailoring house Dunhill, revitalizing the label’s menswear with a worldly, casual universe of clothes. Zippers replaced button closures, humble coach jackets were elevated with premium fabrics, and sportcoats were reinterpreted into garments resembling Japanese kimonos. Three years into his tenure, he departed for Louis Vuitton. His seven-year career at Vuitton took a house predominantly known for its status-symbol accessories and made it a formidable player in the menswear space. Jones’ peripatetic design codes aligned perfectly with a fashion house that already appealed to the jet set. He introduced a line of premium fleece pieces in Fall/Winter 2014 that melded Patagonia staples with high-end branded hardware. In Fall/Winter 2015, he revisited the work of one of his favorite designers, Christopher Nemeth, who moved from London to Tokyo in 1986 and died aged 51 in 2010, creating a line of covetable pieces utilizing Nemeth’s signature artistic prints. Jones revered the late Nemeth’s prescience in melding Savile Row with street-ready silhouettes — and it’s a torch he seems to have picked up. No collection signified that more than Fall/Winter 2017, which saw an unprecedented collaboration between Louis Vuitton and Supreme. To some, it signified the death knell of streetwear, but for Jones, it was a natural progression for two labels that have come to represent two sides of the same coin — creating products that are coveted the world over, yet remain inaccessible to all but a select, extremely lucky few (and those with enough cash to fork over the exorbitant asking price). Indeed, perhaps the term “streetwear” is redundant. Jones brings up one of his favorite designers today, Jun Takahashi of UNDERCOVER, as an example. Takahashi’s acclaimed label often toes the line between punk-infused rip-and-repair garments and graphic-driven pieces with a subversive bent. Earlier in the week, Takahashi held his first-ever menswear fashion show, which Jones attended. 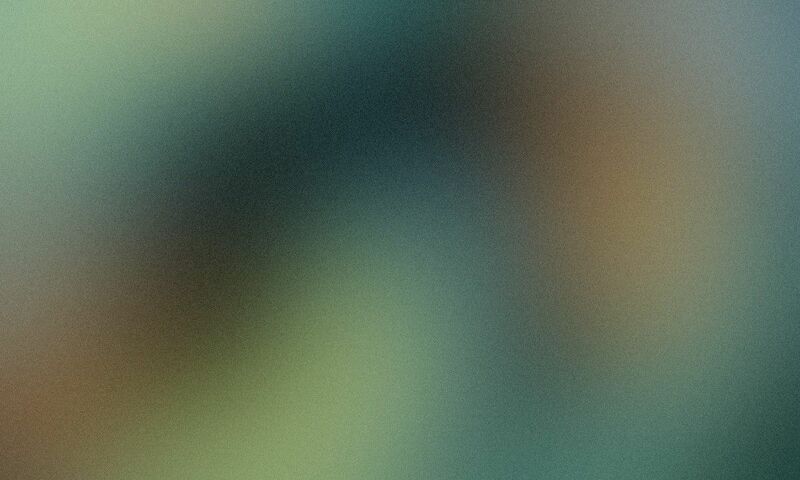 The two are friends and share a mutual admiration. Jones’ realistic approach to the commercial side of Dior’s menswear balances out with a new universe he’s establishing in this first season. First off, he’s renamed the label from “Dior Homme” to the simpler “Dior Men’s.” Dior Homme’s previous designers, Hedi Slimane and Kris Van Assche, left a legacy of predominantly noirish clothes with a dark, somewhat gothic edge. Jones has rewritten the rules with his first collection, equal parts inspired by Mr. Dior’s love of nature and flora and a desire to blend the worlds of Dior’s womenswear and menswear. “Each house I work with, I use different codes and DNA,” he says. “Dior is a tailoring brand, essentially, and we want to be very chic.” Of course, to Jones, “tailoring” means much more than traditional suiting. Plenty of the pieces in his debut collection utilize precious materials and techniques to give classic sportswear garments like bomber jackets, topcoats, and T-shirts a decidedly more artisanal (and slightly femme) look and feel. 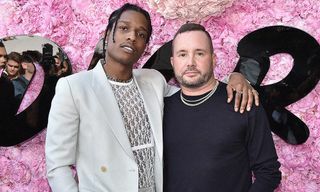 The Dior Homme logo has been replaced with an older design, a sleeker all-caps “DIOR” that also appears on its womenswear, further cementing the connection between Jones’ line and the women’s collections designed by Maria Grazia Chiuri. 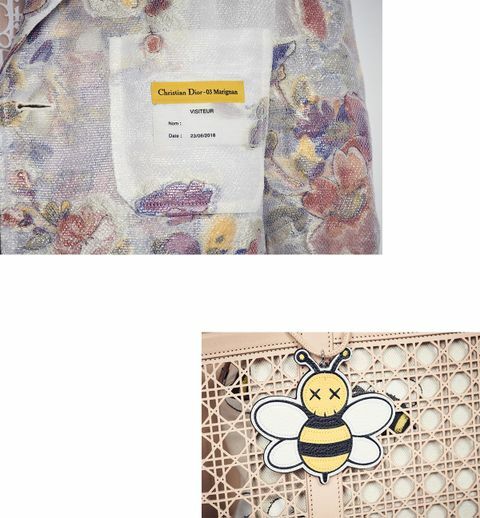 One of the recurring motifs is the toile de jouy pattern designed by Victor Grandpierre in 1947 for the original Dior boutique, repurposed as embroidery and jacquard on shorts, sheer tops, and a technical organza used as a layer on a bomber jacket emblazoned with embroidered bees of KAWS’ design. It’s one of the artist’s many reinterpretations of the house’s codes in the collection, and like most of Jones’ collection, will demand a significant price. Jones is a designer who makes fashion with a capital “F” and Dior is a house that specializes in luxury with a capital “L.” Both words mean something different than they did two years ago. In an era of waning dress codes and upscale casual clothing, a product’s price tag is tied more to its provenance, earned through years of making consistently good product — or to its hype, where the rabid demand far outweighs the scarce supply. 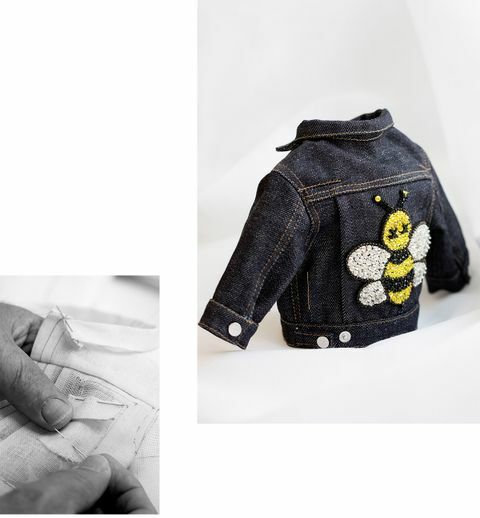 Fashion and luxury are malleable terms that can be applied as much to a covetable sneaker (of which there are many in Dior’s latest collection) as to a denim trucker jacket embroidered with KAWS for Dior bees. It’s appropriate that Jones is at the forefront of LVMH’s golden goose — The New York Times reported in 2017 that Dior holds 41 percent of the share capital and 56.8 percent of the voting rights within the conglomerate. Beccari, like Jones, is a realist about the way people dress today. It’s possible to make sportswear as desirable and elegant as an expensive, one-of-a-kind couture creation, and if you can make the right emotional connection with a potential client, they’ll gladly pay the asking price. 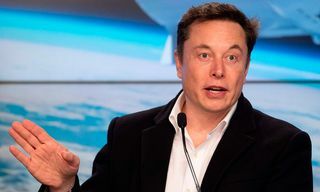 What Jones brings to the table is an ability to meld the impulsive part of the lizard brain, the part that covets new products, with the elevated execution of a designer who knows how to rework the existing codes of a fashion house. If streetwear is a movement built largely on placing high fashion in a different, more accessible context, Jones is able to take that energy to an esteemed house like Dior without having to compromise on quality or worry about things like price points. 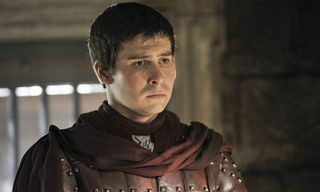 It has also afforded him the opportunity to bring some friends along the way. Streetwear, after all, was a bustling community of like-minded creatives before it was an industry. KAWS and Jones have been on each other’s radar for quite some time, and both also work with Nike on sought-after collaborations. The two had been in touch prior to Jones’ appointment at Dior, and when it came to Jones’ debut show, he couldn’t think of a better person to help make a statement. 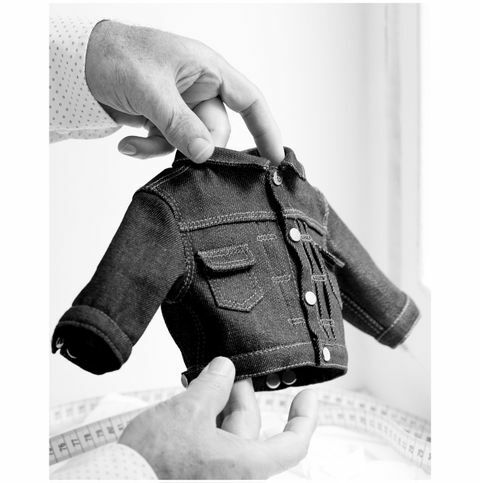 Before KAWS built the statue for the show (and a smaller rendition that lives in Dior’s showroom), the artist was commissioned to design plush “BFF” toys decked out in Dior Baby clothing, a sub-line KAWS didn’t even know existed. 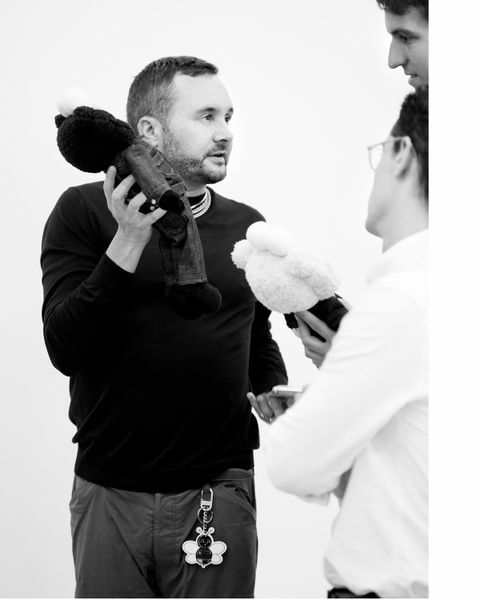 On Jones’ Instagram in the days leading up to the show, he posted a plethora of celebrities, including A$AP Rocky, Kate Moss, and even Louis Vuitton’s new men’s artistic director Virgil Abloh, posing with the two stuffed toys. KAWS admits he was initially hesitant to move forward with the sculpture, as art world timelines are much more forgiving than those in fashion, and was impressed that Dior could pull together such a massive undertaking in a matter of months. 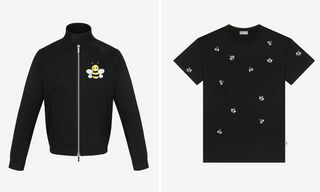 In addition to the Dior bee motif, KAWS also remade the Dior logo in his own style, and a variety of his works show up again in the accessories collection, spearheaded by designer Yoon Ahn of cult Japanese jewelry label AMBUSH. Ahn’s approach to the accessories line is complementary to the cavalcade of colors in Jones’ collection. KAWS’ bee and Mr. Dior BFF reappear as studded pendants and high-end keychains. 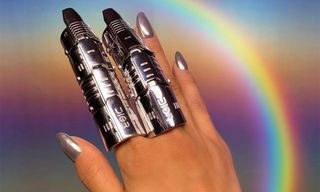 Chunky, iridescent letters refashioned into rings spell out “DIOR,” and there are even plush keychains depicting Mr. Dior’s dog Bobby tie-dyed in psychedelic colors. 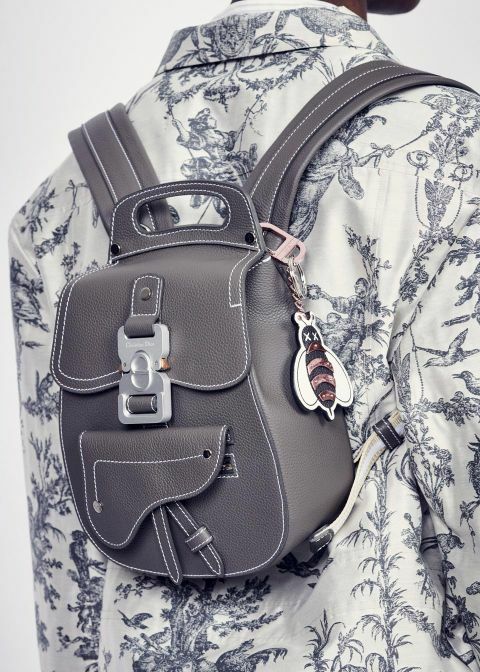 Tying into Jones’ desire to bring more elements of womenswear into the collection, this is the first season that Dior’s best-selling saddle bag has been recontextualized into the men’s offering, appearing as soft leather side bags, pouches, backpacks, and other elegant luggage pieces. Notably, many of the new bags, belts, and even baseball caps feature custom buckles designed by Matthew Williams of 1019 ALYX 9SM, a nascent label known for its Rollercoaster belts inspired by chunky, tactical quick-release COBRA buckles. “Kim and I had been friends a long time, and he was somebody that really mentored me and motivated me to start my own brand,” says Williams. After Williams’ first season, he gifted Jones one of his backpacks featuring 1019 ALYX 9SM’s custom buckles, and Jones loved it. For Dior, Williams has designed several buckles that meld the utilitarian appeal of the originals with the elevated branding of Dior. In one instance, he turns Christian Dior’s “C” and “D” initials into an interlocking buckle. It features on a baseball cap that London grime artist Skepta wore to the show. “He gave me, like, two months to make these buckles, and I just pulled it together for him,” Williams says. Jones might define streetwear merely as clothes people wear on the street, but his approach to Dior Men’s has much more in common with the mindset of the culture’s progenitors. 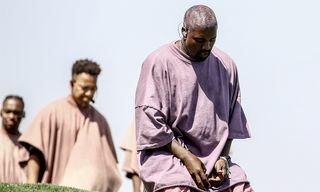 He’s designing clothing for people with a specific mindset, and he’s tapped some of his high-profile creative friends to fashion covetable products they might not have been able to create on their own. The shift in consumer desire and what cultivates a passion for product is not lost on Jones. He’s fully aware of the dichotomy of balancing a consistent vision for a brand with creating new commercial hits season after season. That’s why introducing the saddle bag for men alongside several new sneaker silhouettes is telling. After all, more and more men (and women) have been sporting fanny packs and waist bags from streetwear brands and luxury labels alike. 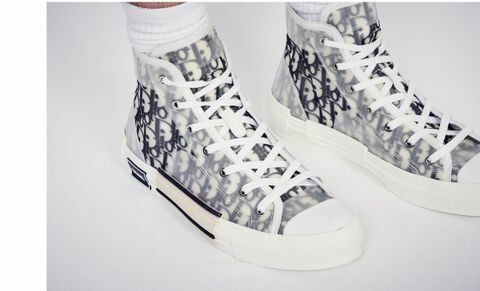 Sneakers have become a status symbol for men and women, so it’s not far-fetched to think Jones sees a future in which a Dior purse gets a second life as a must-have men’s accessory, especially when it has a Williams-designed buckle. “It” brands and “it” products ebb and flow season after season, but pieces like that have the potential to become longtime grails.